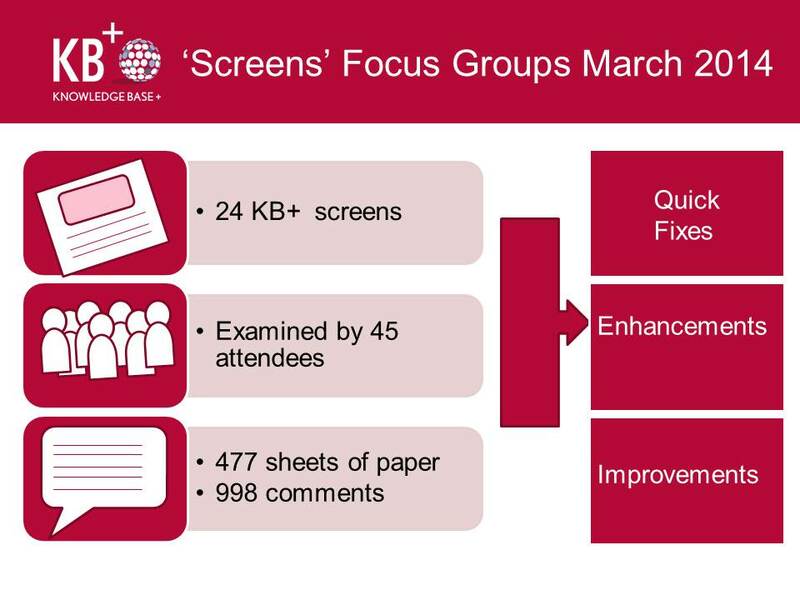 We ran 3 focusgroups in March looking specifically at some of the common pages used in KB+ as well asking for general feedback and ideas. I was pleased to attend the London meeting not only as an opportunity to feedback on the system from a datamanager point of view but also to meet those using or thinking about using KB+. At the focus group we were presented with multiple screenshots of the system to comment on which helped focus the discussion. The paperwork (all 477 sheets) from the 3 focus groups has now been collated and entered on a spreadsheet with 998 comments from 45 attendees. A list of enhancements and improvements which we will be asking the community to vote on. We wanted to thank everyone who attended for their time and valuable feedback. All your comments and ideas are a great help in planning how we develop KB+. Jisc Inform, the charity’s termly online magazine, published a look at KB+ in their spring edition. It includes a round-up of the work so far and a look into the future of KB+. You can sign up to receive Jisc Inform and keep up-to-date with all things education, research and technology! I was pleased to be invited to attend a ‘Making the most out of JUSP’ workshop to talk about how JUSP and KB+ have been working together. It was a really useful day in terms of gaining a better understanding of the benefits JUSP provides to institutions and also how they have worked in building an engaged and enthusiastic community. I was also pleased to be able to chat about e-resources with librarians, something I never tire of. The day started with a presentation from Tim Peacock, from the University of Derby and their experience of using JUSP, his talk concluded with some questions which were a useful springboard for discussion amongst the table with regards how they use JUSP, who in the institution they need to share the data with etc. Tim noted that the content coverage in JUSP does not cover all the titles which they subscribe to, this is also the case for KB+ and I can see an opportunity to work together to help prioritise and increase our knowledge base coverage. JUSP provided practical exercises for groups to work through which highlight the available reports, features and functionality of the system. Judging from the animated discussion and buzz in the room these exercises were really successful and is something I think would be useful to try with KB+. For my presentation I talked about our similar core foundations in terms of both being a shared service and the importance of collaboration with the community to create systems fit for need. JUSP and KB+ grew from a need to help tackle challenges faced across many institutions and in providing a national solution we offer the opportunity to reduce time and effort. 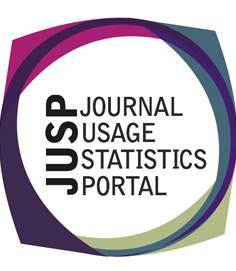 The need for integration between KB+ and JUSP has been echoed in both communities so I was pleased to demonstrate how you can view JR1 stats in KB+ and also that JUSP are making use of the title lists created in KB+. We have further plans for more effective data sharing between the systems, including aiming to allow institutions to only mark up titles in one system and then sharing this with the other system which again will hopefully save time and effort. The day ended with a recap of some of the new developments in JUSP including a website refresh, the introduction of Usage Profiling, Counter 4 and discussions with vendors regarding interoperability between systems and use of the JUSP API. An enjoyable and useful day which I hope is the start of more joint events. Presentations from the day will shortly be available from the JUSP website.